History – Lake Truck Lines Inc.
Lake Truck Lines received its Railroad Commission Authority in Eagle Lake, Texas in November, 1949. 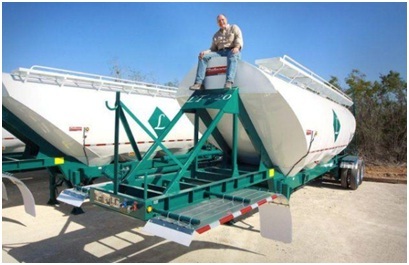 Founder, Joe P. Cain, relocated the company to Houston, Texas in 1950 and began a successful run hauling fertilizer for local farmers – working out of a single room office that included just a telephone and a notepad. By 1960, Lake Truck Lines was delivering oilfield materials throughout East Texas and South Louisiana. The company was purchased by Douglas S. Cain in 1983. Mr. Cain worked tirelessly to keep the company viable through the long and troubling downturn of the mid-80’s and emerged as a dedicated oilfield services carrier in the early 2000’s. With the upward trend in oil and gas exploration of the new millennium, Lake expanded its operations to include South Texas where, based on the trends in Texas unconventional shale exploitation, Mr. Cain moved its corporate operations to take advantage of the vigorous activity in Eagle Ford Shale. Lake broke ground on its current location at 20474 Spanish Grant Road, San Antonio, TX in June 2011. The 10-acre property was graded, set up for industrial traffic, improved with a mechanical shop and, later, a 6000 sq. ft. administration building where the company manages its business. With the emergence of the Permian Basin Shale play, Lake expanded its operational footprint by opening a second industrial terminal in West Texas in 2012. Located at 2630 E. Pearl Street, Odessa, TX, the site boasts a mechanic’s shop, man camp, and yard. Based on the growth of its Permian Basin business, Lake has opened satellite operations in Monahans, TX, Kermit, TX, and Hobbs, NM. Lake Truck Lines was built on a foundation of dedicated customer service and a loyal commitment to the oilfield industry and continued that legacy today.